L-banner stands offering optimum portability with attractive graphics portable banner stands work as the most cost effective mode of visual display during trade shows, exhibitions, events and conventions. 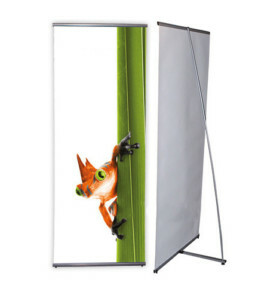 Portable, lightweight and easy to set up L-frame banner stands decorated with eye-catching artwork and graphics will surely grab the attention of a larger audience.The display is custom made with options to create flexible backdrops. When not in use, you can fold the L-Banner stands and store them safely. Portable, lightweight and easy to set up.